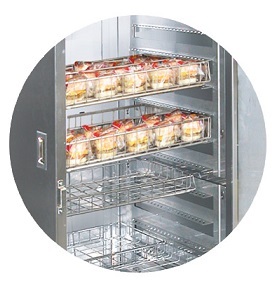 Commercial foodservice operators rely on bulk heated holding cabinets to keep their product at a safe temperature during periods of peak demand. Equipment needs to have the flexibility to hold food for both short-term staging and prolonged periods, while maintaining 'just-cooked' quality. When food products need to be prepared and held in bulk, finding the appropriate holding and warming equipment that work for your operation can prove difficult. FWE offers the most versatile and best preforming bulk heated holding cabinets on the market today, all specifically designed to meet your needs. Our universal heated holding models are designed to fit a 'universal' variety of pan and tray sizes, while pan servers accommodate pans of varying depths. No matter the product or space available, we have the best options to fit your unique operation. The most significant difference between the pan server models and the universal server models is the slides. The UHS and UHST series are built to hold both pans and trays with fully adjustable universal slides, designed with your operations' ever-changing agenda in mind. The universal tray slides offer the high capacity of two pans per set of slides. The universal servers' tray slides are nickel plated for greater durability and sanitation, fully adjustable, removable and designed to give secure bottom tray support. FWE's PS and PST series are built to accommodate both shallow and deep pans. Units are equipped with unique pan slide racks. The front edges are relived for easy loading, no tip, one piece die stamped stainless steel for extra strength. Racks lift off from heavy-duty stainless steel supports and are removable, without tools, for easy cleaning. The specific needs of your operation determine the heat system that will work best. Heated holding units that offer humidity control are an asset for operations dealing with moisture sensitive foods. Since food is made predominately of water, many foods keep longer and will not dry out as rapidly in a humid environment. Both the PS series and UHS series come equipped with FWE's Humi-Temp heat system. 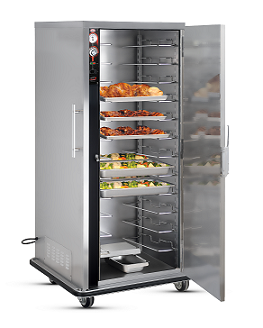 The Humi-Temp heat system pre-conditions the cabinet environment by gently circulating moist air throughout the interior, eliminating hot and cold spots. The bottom mounted heating element and blower system create heated air that collects moisture as it passes over the water pan to create a humid cabinet environment. The heating system minimizes temperature difference top-to-bottom and side-to-side, allowing the entire cabinet to be used, even the lowest shelf. Humidity levels within the cabinet depend upon the water pan level and the cabinet temperature. Cabinets in both series come standard with a removable water pan which slide in and out for easy water filling and cleaning. Since not all operations require moisture, both the PST series and the UHST series use FWE's Top Mount Heat System. This heat system enables large air circulation of hot air throughout the interior of the cabinet, eliminating hot and cold spots. These units are ideal for operations looking for an open bottom base, free of obstructions. The open bottom base allows for an additional pan or tray to be added on the bottom of the cabinet, giving these models increased capacity. Heating elements and blower are protected from spillage and leave the bottom of the cabinet open for easy cleaning and reduced maintenance costs. The Top-Mount heat system promotes a slim cabinet design, allowing the cabinet to fit easily into tight spaces without sacrificing needed capacity. No matter what heat system or tray slide system is used, all of FWE's bulk heated holding cabinets are made for transport applications. Units are fully constructed of stainless steel, have a welded base frame and are designed to absorb vibration and shock during transport. Units are fully insulated throughout the cabinet and door to provide energy efficient heating and longer holding times. Full perimeter bumpers are standard on many units and allow nesting of units while protecting cabinet and handles. Simple and easy to use controls are user friendly, easy to read, and easy to set. Controls include a full-range thermostat for easy operation and to give you full control over your product. All units with a top-mount heat system come standard with electronic controls and are provided with a low temperature alarm that alerts operators both audibly and visually if the internal cabinet temperature drops below a customer designated threshold level. Electronic control panels can be added as an upgrade for all cabinets with a Humi-Temp heat system. FWE tray servers are a good fit for operation holding their product on sheet trays. All tray servers come standard with no tip tray slides. Tray slide grip design secures sheet trays from moving side-to-side for stabilized transport while supporting tray load from bottom. To learn more about FWE tray servers, visit www.fwe.com/learn/An-Introduction-to-Tray-Servers. UHST-B series utilizes FWE's Universal 'Wire Speed Basket' which was specifically designed to provide needed capacity and holding performance for operations using wire speed baskets. From retherm to speed-line operations, these units address the common requirement for additional flexibility and back-up holding of finished products in wire baskets, as well as flexibility to accommodate sheet trays. Click here to learn more. 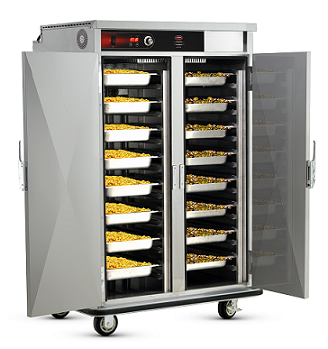 Combi-companion 'HHC-CC' series allows you to simply roll in any full size 'combi' rack into the FWE Heated Holding Cabinet - maximizing and immediately increasing the capacity of your 'combi' oven. 'Combi'-ovens use both convention and steam heat during the cooking process and are able to switch between them automatically. With the HHC-CC series operations are able to increase 'combi' capacity and rack management. Click here to learn more. FWE's heated serving wells can be rolled out when you are ready to serve. The mobile serving station provides heated top serving wells and heated lower compartments to keep refills close at hand. Each well and heated compartment is controlled separately for added versatility. A soft radiant, uniform heat gently surrounds food to provide a better appearance, taste and longer holding time. Heated wells are available from a single well unit up to a serving line of six wells. To learn more visit www.fwe.com/learn/An-Introduction-to-Heated-Serving-Wells. We did the math. Using a FWE bulk heated holding cart can save you hundreds on operational costs. When you look at the ongoing costs of power, one of FWE's Energy Star certified models is less than half the expense of the other guy. To learn more and see a full list of FWE Energy Star certified models, visit www.fwe.com/energy-star. HDM Security Packages are available to meet correctional needs. To learn specifics, see a full catalog of correctional equipment offered by FWE and see photos, visit www.fwe.com/learn/An-Introduction-to-Correctional-Foodservice-Equipment. With FWE's Quick Ship program, many models are available for available immediate shipment, shipping within 48 hours. Quick Ship terms and conditions apply. To learn more, visit www.fwe.com/quickship. FWE offers a variety of optional accessories for our bulk heated holding equipment, to learn specifics, see literature, additional photos and get a quote, visit www.fwe.com/products/heated-holding.